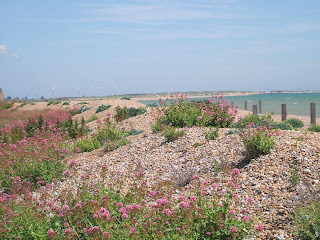 These photos were all taken on a walk along Winchelsea seafront. 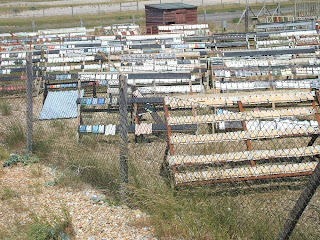 I'm a sucker for information boards - I love to find out about the area and the wildflowers. 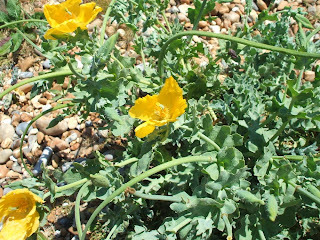 These are yellow horned poppies - you can see why! 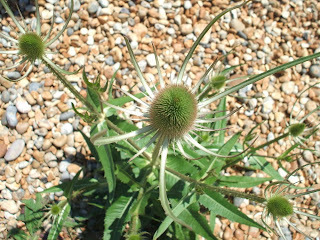 Teasels - love the sculptural shape. I remember making hedgehogs out of them as a child. 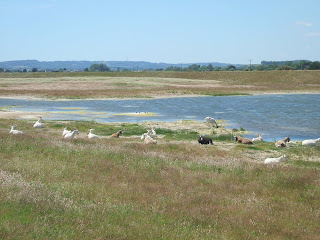 A lagoon just off the beach was filled not with the seabirds we were expecting but by goats. Another surprise. We decided this must be a testing area for roofing paint or something like that. Odd! You can just see the wind farm in the distance. I'm a fan (no pun intended!) I think they're quite beautiful. 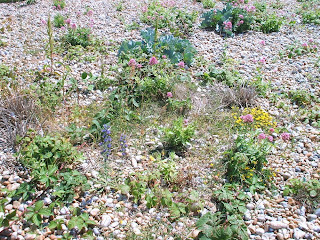 Our gravel garden is starting to fill with wild flowers now, this beach look is what we're aiming for. I was going to comment on the gorgeous beach but then I saw the seagulls! Awww! I think they might be my favorites so far. Heather, those seagulls are the cutest ever (so much cuter than that ones we have here that pester you for food!). Great pics of your walk..."teasels", here in Ontario we call them "thistles"
I love seeing pictures from your walks :) Those seagulls are really cute! Such beautiful pictures! 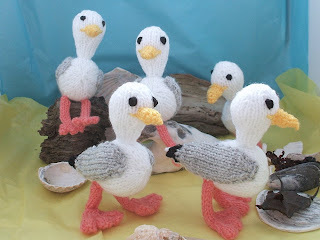 And those seagulls are adorable. Thanks for everyone who is voting for Sassafrass! i don't know you all, but thanks to Nifty, we may just be able to pull this one out! You can vote, as can hubby's and friend and children, until noon EST Tuesday, which I think is about 5:30 your time in GB? My dad is British so hey another reason to vote. 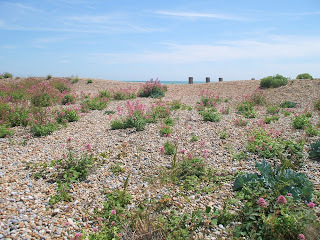 Nifty's photos make me want to move there (midsomer? 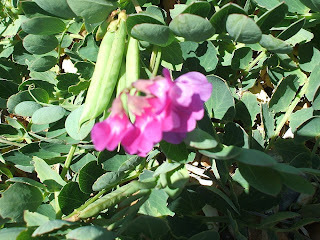 ), its waaay too hot here! Hey, Nifty, my dad used to work for Rohm and Haas (better living through chemistry!LOL) and I believe those are paint samples left to see how they weather! Its very interesting. Some chalk on purpose to 'clean' the paint in the rain. Some have more dryers in them to dry quickly and that may affect weatherability too. I thought the Tamworth two were regular piggies?